Don't let the low prices fool you: Old Navy activewear is legit. Mesh panels are all the rage right nowâand the mesh trim on these crops is both functional and fun. That, in combination with the sweat-wicking fabric, will keep you cool and dry as you're heating up. 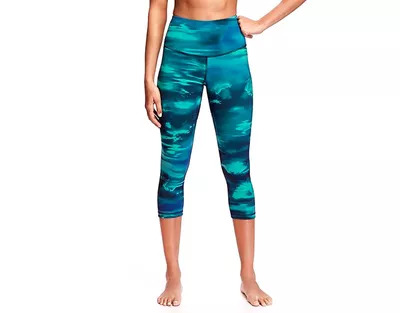 These tight-fitting high-rise pants will ensure that you're held in, and they fit like a second skin so you can go about your workout confident that they will stay in place. Worried about your sun exposure when you're at the track or on the trails? With these crops, you won't have toâthey are made with UPF 40, giving you some built-in sun protection (and peace of mind) while you're outside. These eye-catching crops have flatlock seams to help prevent chafing, allowing you to stay comfortable throughout your workout. 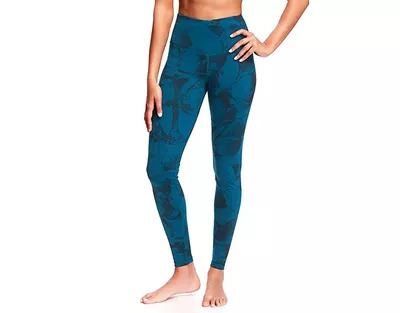 If you're looking for a more relaxed pant, this straight-leg pair is the perfect compromise between flared yoga pants and waist-to-ankle tight leggings.